Resources for Morgellons investigators. Skeptical analysis and discussion. So can the items in the photos be described as “coenocytic” or “hyphae-like”? The two photos are titled “Objects emerging from lesion on child’s lip at 200X”. Now given this “200X”, how long does that make the “objects”? We can’t really say, as the images themselves could be scaled to any size. But approximately, the “fibers” on my screen are 40mm long, and 2mm thick. This makes them 0.2mm long, and 0.01mm thick. (200 microns by 10 microns, where 1 micron=0.001mm). This puts them approximately in the same scale as hyphae (the living, growing parts of fungi, tiny tubes filled with cytoplasm and nuclie). Huh? Even if measuring off 1:1 the screen, then at 200x magnification, 150 microns would appear as 30mm wide (about an inch). Plainly the objects are not 150, and are more like 15 microns thick. Either that or the photos are labled incorrectly. However, the SEM photos clearly show “fibers” that are about 15 microns. Hypha can be both septate and aseptate (Coenocytic). Septate hyphae are divided by cross section segments called septa. Aseptate hyphae are not. Detrmining if a structure is septate or aseptate is difficult with the images provided, as the most of the structures are out of focus. The clearest structure (in the first image) actually shows some evidence of being septate, rather than aseptate. The picture appears to have been taken with reflective light (from above), and a better determination could be made with transmissive light (from below). Additionally, the specimen should be mounted on a slide and stained to enhance contrast. However, this photo does not resemble the first photos at all, clearly they are different structures, much longer, and smoother. Then we have some SEM (Scanning Electron Microscope) photos. These photos reveal surface features. Here we have a scale, showing the object is about 15 microns thick. Human hair is generally described as “60-100 microns in diameter”, which would seem to eliminate that as a candidate. However, that is the diameter of full grown head hair (a “terminal” hair). Finer new grown body hair will emerge with an initial diameter that is much smaller, children are covered in “vellus” hair, which has a diameter of under 30 microns. Going back to the first photo, since the “structures” here are from a lesion on the lip of a child”, and the lesions clearly extend beyond the actual lip surface, then is it not reasonably to think they might be vellus hairs, coated in some viscous liquid (blood, puss or sebum)? 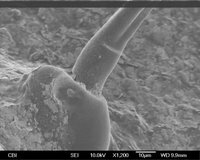 Some of the Morgellons SEM’s on their website are clearly the hyphae of Wangiella. Google Images has a micrograph matching the Morgellons micrograph. for jesus spoke of “they bite like dogs and sting like scorpians” for this is the orginal sin that entered the body of adam. you must go beyond your “norm” of science when dealing with this “navel creature that lives in the intestinal cavity. this “sea monsters” that “VINE” up the spine. If you do not have this, which you do, revelations has spoke about this fallen angels evil ways, that at this time, rich or poor, free or in slaved, creatures great and small(micro-evulotion for be frankily truthfull) are in bonded by this serpent like creatures. Daniels diet for the bible will cure this. one must search for the cure of morgellons by “finding” the bibical knowledge of what to eat from the “garden of eden”. Do this and you will know truth. fruit trees and herbs. also, diatom earth distroys these creatures. try it and proof will be there. 3. People who think they have "Morgellons" probably have a mixed variety of physical and/or mental illnesses. Delusional disorders in dermatology: a brief review. Does this family have Morgellons? Agrobacterium and Cellulose Fibers – or Cotton? Why do Antibiotics help with Morgellons? How many people have Morgellons? Why does the MRF recommend Lymebusters? What is the CDC doing about Morgellons? Why don’t doctors get Morgellons? We all have the same symptoms! Schwartz, CIA, France, Bottled Water. Do you want to have Morgellons? How good is your eyesight? Why do some hairs move? The far side of Morgellons meets the near side. 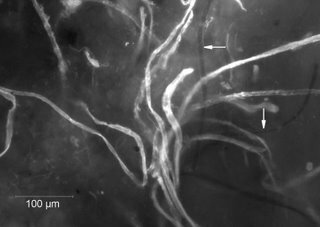 How do fibers get under the skin? Atopic Dermatitis, Scabies, et al.